What is so special about Alpe d’Huez: nicknamed “The Sun Island” because of its exceptional sunshine (about 300 days of sunshine a year according to French weather forecast), the Alpe d’Huez is a ski destination of international renown. Located on a south-facing plateau at an altitude of 1860 meters overlooking the Oisans valley, the ski resort of Alpe d’Huez benefits from many assets, like its high altitude up to 3,300m, 252 kms of pistes, 2 snow-parks and 111 pistes. It is also why Alpe d’Huez apartments for sale are becoming so popular. Alpe d’Huez nearest airport is Grenoble but you also have Lyon and Geneva within easy reach. Alpe d’huez grand domaine ski pass gives you access to one of the best snow-sure ski area in Europe. 350 million euros in investment will fit Alpe d’Huez new lift systems and will transform Alpe d’Huez resort in the new modern ski destination. Rich in many sports activities (snow / ice, air …), cultural and relaxation, the Alpe d’Huez is also the scene of big international events throughout the winter! 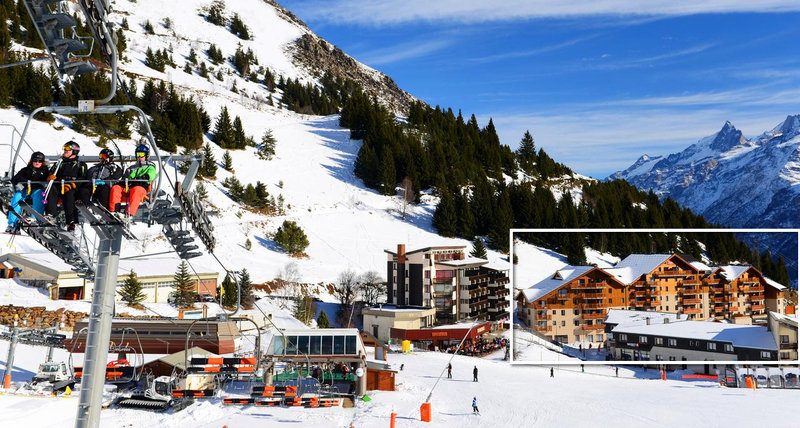 Formerly known as the Massif des Grandes Rousses and now called “Alpe d’Huez ski area or Grand Domaine Ski” the ski area of ​​Alpe d’Huez is made up of 7 ski resorts / villages with distinct specificities: preserved, functional, family, sports. .. they have come together to meet all desires and profiles. Alpe d’Huez Grand Domaine Ski stretches over 10,000 hectares facing south-west, with 4 sectors: Oz-Vaujany, Alpe d’Huez, Auris-La Garde and Villard-Reculas. Located between 1100 and 3330 meters above sea level, the ski area consists of 133 tracks (43 green, 34 blue, 40 red and 16 black) served by 81 lifts that will take you quickly to the highest point – the Pic Blanc at 3330 meters altitude – where a breathtaking panorama awaits you. – More experienced skiers will appreciate the black runs accessible from the Pic Blanc cable car and the Marmottes III cable car. It should also be noted that Alpe d’Huez has a night toboggan run, a permanent toboggan area and 4 night ski slopes. With 50 km of slopes, Alpe d’Huez is a beautiful Nordic ski resort with 6 courses varying between 4 and 20 km. Between balconies and lookouts, vast expanses and frozen lakes, Nordic skiing seduces holidaymakers in search of new sensations, closer to nature. For non-skiers, Alpe d’Huez also offers activities such as paragliding, snowmobile or snowcat rides, an ice cave accessible by the DMC des Grandes Rousses, guided tours and pedestrian walks ( 35km of marked trails), an ice rink, two swimming pools, ice driving courses, Ski Joëring or even the complete set for relaxation and well-being (massages, sauna, hot tub …). Imagine a place entirely devoted to sports, relaxation and leisure activities. Located in the heart of the resort and open every day from 10h to 20h25, this is exactly what offers the Palace of Sports and Congress Alpe d’Huez with no less than 30 activities grouped together in the same building (fitness, bodybuilding, water aerobics, indoor and outdoor pools, climbing wall, archery, basketball, badminton, squash, tennis …). On the cultural side, the palace also houses a cinema as well as the Musée d’Huez and Oisans. In addition to the fifteen mountain restaurants scattered throughout the ski area, the Alpe d’Huez also has no less than 40 restaurants scattered in the heart of the resort and a dozen fast food restaurants (sandwich shops, hot spots and other embroideries). Traditional cuisine, mountain specialties, regional menu, brasérade, homemade soups, pancakes, pizza … it’s up to you! – “Apéros et fondues by night”: the meeting place for gourmets from 5pm on the terrace of the Signal 2108 restaurant! On the program: an aperitif, 2 hours of skiing on the lit track of the Signal, a fondue, followed by a torchlight descent … (every Tuesday / Thursday school holidays and every Thursday throughout the season). – Sarenne in the moonlight On the Sarenne piste, night skiing is also possible! The last bucket, allowing the climb to the top of the Pic Blanc, leads skiers into a shelter. After a friendly dinner, until the moonlight reaches its peak to illuminate the runway, an hour of descent is planned in the company of ski patrol-rescuers and ski instructors graduates. – The Ice Cave, an ephemeral museum dug under the snow at 2700 meters above sea level, is accessible to all by the Grandes Rousses gondola lift.